Smosh works as a comedy YouTube channel because it exists to be funny. In other words, the channel is dedicated to comedy before anything else. Other channels on this list of the funniest YouTube channels are something else primarily (reviewer, vlogger, etc. ), but Smosh wants to be funny and is trying to be funny. Of course, that does not always result in actually being funny, but in this case it does. In fact, it is perhaps unfair to call Smosh a YouTube channel at all as it existed before the video platform. Ian Hecox and Anthony Padilla started publishing videos in 2003 and actually founded Smosh in 2002. Of course, since the rise of YouTube, the platform has become the medium of choice for the guys to send out content. Smosh is also among the most popular YouTube channels with 22 million current subscribers and over 7 billion video views. Specializing in sketch comedy, the Smosh team has created some truly hilarious skits, and have even starred in their own movie. While a reaction channel first and foremost, h3h3 gained popularity because of the comedy styling’s of Ethan Klein, the main voice behind the channel. Ranging from genuinely observant to absurdist comedy, Klein is something of a genius at finding the ridiculous and turning it into properly funny commentary. One of the best things about h3h3Productions is that it is based on essentially mocking others, but Ethan and his wife and occasional co-host Hila never resort to outright mocking these people. There is a fine line and a lot of heart behind the channel that makes it engaging, while Ethan is also a very self-deprecating personality. Already popular, h3h3Productions took on a new life when it was sued by fellow YouTuber Matt Hoss, who took offence to Klein’s reaction to his videos. What followed was a court case that set a modern standard for fair use of content and set several precedents on YouTube. Currently, h3h3Productions that got into our list of the funniest channels on YouTube has 5.59 million subscribers. There are many informative and funny movie channels on YouTube; Screen Junkies and CinemaSins are amongst the most popular. However, it is to Milwaukee and a relatively small channel that you must go to get some truly memorable insight on cinema and a unique comedic tone. RedLetterMedia first came to prominence when founder Mike Stoklasa created a 90-minute long video essay deconstructing the Star Wars prequels. Hardly comedic fodder, but Stoklasa sprinkled his legitimate points with a deep humor that has since allowed the channel to grow. Admittedly adult in nature and definitely subjective, the comedy on RedLetterMedia can be side-splittingly funny. For the most hilarity, check out the Best of the Worst, a web series where the gang watch terrible B movies and dismantle them in (usually drink fueled) round table discussions. With only 760,000 subscribers, on the surface RedLetterMedia is one of the smallest among the funniest YouTube channels on the list. However, it has been hugely influential to other movie-focused channels and has a very high viewer-to-subscriber ratio, often topping 90%. Those are numbers some of the biggest YouTubers cannot achieve. Of all the funniest YouTube channels and characters, Filthy Frank is probably the most unforgettable once you have seen him. Whether that’s a good or bad thing we’ll let you decide, but the controversial character gained legions of fans thanks to his unfiltered mouth and very funny skits. Created by George Miller, TVFilthyFrank was a foul mouthed man described as an anti-vlogger. Ranging from disgusting food contests and annoyed tirades, TVFilthyFrank was capable of treading a fine line to being uncomfortable. Of course, plenty of the best comedy comes from that place and while Frank could definitely cross the line, he was often purely hilarious. Certainly not for everyone, Filthy Frank became hugely popular and one of the funniest channels on YouTube scored millions of subscribers. You may have noticed we are talking about TVFilthyFrank in the past tense. That’s because Miller announced in 2017 that he is stepping away from the character and essentially retiring the Filthy Frank persona. Some people just cut the BS, and that can be refreshing and funny. Phil DeFranco is certainly one of those. His videos are not designed to be outright pure comedy, but thanks to DeFranco’s sardonic delivery, sharp observations, and willingness to tell it straight, the result is often hilarious. Typically, DeFranco takes an important world event and simply talks about it. This can be a major political situation, a celebrity scandal, or something happening in the YouTube community. Whatever it is, DeFranco lends a certain gravitas and his opinion has become widely respected in the YouTube community. While Philip DeFranco can be very funny, it is his willingness to get serious that makes him a growing authority in the YouTube media. Since starting in 2006, DeFranco’s channel has grown and now boasts over 6.1 million subscribers, while his videos routinely surpass one million views. 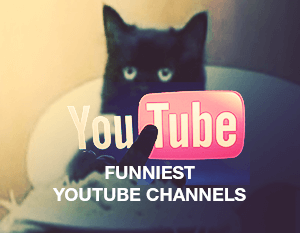 As always, we also want to point out that the channels we have included in our list of the funniest YouTube channels 2018 only scratch the surface of what is available. Hundreds of thousands of videos are uploaded to YouTube every day, so chances are, if you find something funny you will find related content on the platform, whether that’s someone falling over or someone telling jokes. The channels above are the best place to start, but why not dive into YouTube and find something that is perfect for you? Check out the list of 10 funny Instagram accounts to have your daily dose of funny pictures along with the videos. Tags: funniest YouTube channels, funniest channels on YouTube, funniest YouTube channels 2018, h3h3Productions, Philip DeFranco, RedLetterMedia, Smosh, TVFilthyFrank.